Roman Numerals are used all over the world. This website will show you how to read & write them PLUS provide lots of interesting examples of their uses. 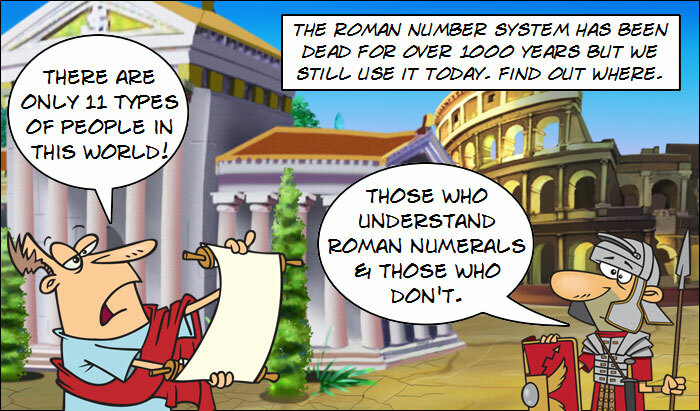 The site also contains many activities designed to help you practice Roman numbers & and some really awful ‘dad jokes’. Explore the world of Roman Numerals here. Learn all about the number system of Ancient Rome. Learn how Roman numerals began & how easy it is to write them. Explore all the places we still use Roman numerals, you’d be surprised how much we still use these numbers (not numers) when you start to look. Narrator – The Roman Number System has been dead for over 1000 years but we still use it today. Find out where. – easier than it sounds 🙂 v.
– The Beginnings of Rome vi. – a French King Did It viii. – How old is Your Show? are a Joke 🙂 xviii.